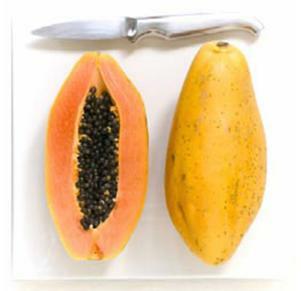 What it does: Applied as a face mask, mashed unripe papaya will remove dead, flaky skin. How to do it: Mash some fresh papaya, unripe is better. Apply on clean skin as a mask for 20-30 minutes. Wash off with warm water. Why it helps: Like pineapple, the enzymes in papaya (papain) is a natural BHA. believe it or not, papaya soap is popular in the phillippines as a skin whitening tool! @ Nadya.. You’re right, there’s a lot of different brands of papaya soaps and lotions. But like this article, I use papaya as an exfoliante and moisturizer, I just add a little milk to the mashed papaya.